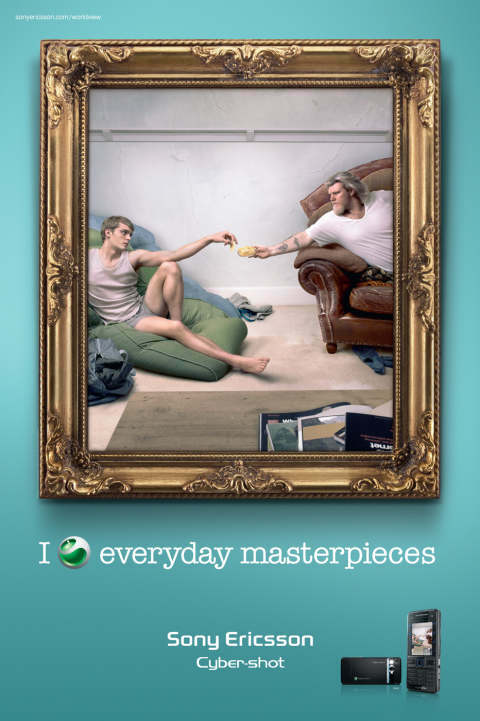 Sony Ericsson is promoting the Cyber-shot digital camera and camera phone in outdoor settings in Australia with a set of variations on the Michelangelo Creation of Adam fresco. The original masterpiece can be viewed on the ceiling of the Sistine Chapel in the Vatican City. The three masterpieces presented here, with beer, hot dog and chips in an Australian lounge, are being viewed this week on the sides of buses. The Masterpieces guide viewers to www.sonyericsson.com/worldview, where they are invited to submit photographs in an international competition. The Masterpieces campaign was developed at Saatchi & Saatchi Australia, Sydney, by business director Sarah Quinn, senior business manager Natalie Chan, executive creative director Steve Back, creative director Dave Bowman, art directors Nic Buckingham and Toby Pike, copywriter Paul Bootlis, strategic planner Neal Fairfield, print producer Jeremy de Villiers, artbuyer Skye Houghton and photographer Chris Mollison, working with Sony Ericsson Oceania marketing manager Josh Oxspring.